Rose Coschignano/Staff Photographer David Cingranelli, a political science professor at Binghamton University and co-director of the Cingranelli-Richards (CIRI) Human Rights Data Project, discusses the human rights implications of the 2018 midterm elections. On Monday, students gathered in Lecture Hall 12 to hear about the impact of the 2018 midterm elections from a human rights expert. David Cingranelli, Binghamton University professor of political science, discussed the status of human rights in the world and the human rights implications of the elections. Cingranelli, an expert in human rights, has worked at the University since 1976, serving as the associate dean of Harpur College and as co-director of the Cingranelli-Richards (CIRI) Human Rights Data Project, the largest and most widely used human rights dataset in the world. In his time at BU, he has written widely on human rights, democracy and governance. 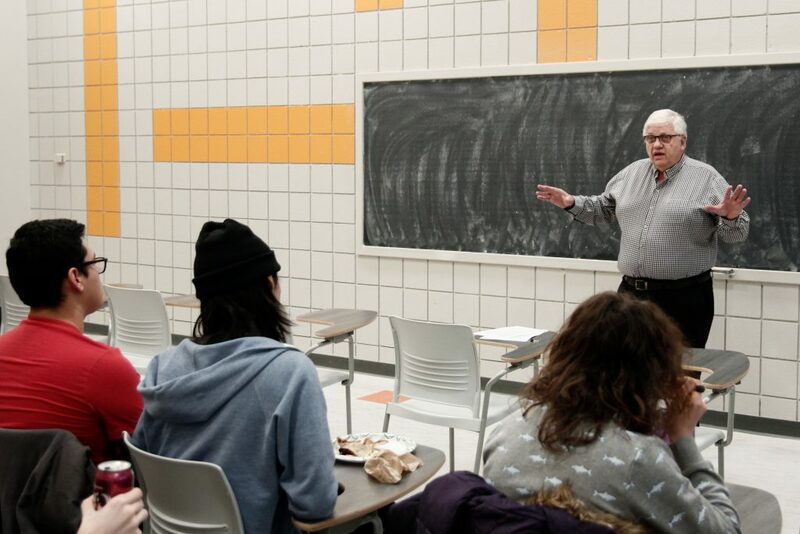 Cingranelli also used the event as an opportunity to talk to students about the University’s new minor in human rights, which was approved last spring. Ryan Sharpelletti, a junior double-majoring in political science and computer science, said he was responsible for organizing the event and thought Cingranelli would be a great person to moderate it. Cingranelli began his discussion by providing background on the history of the International Bill of Human Rights, which was signed in San Francisco in 1948 and in the wake of World War II with the intention of preventing another mass atrocity. According to Cingranelli, ever since the bill was passed, the subject of human rights has carried some controversy on the world stage as it has put in question the matter of national sovereignty, which certain countries have been reluctant to forgo. Moving into the current era, the protection of issues such as health coverage, enfranchisement and treatment of immigrants are all human rights issues that were at stake in the 2018 midterm elections. Cingranelli also discussed the Trump administration’s withdrawal of the United States from the Human Rights Council, which he said he deemed a blow to the international upholding of human rights. “It’s really a pretty big deal that a government that claims to be a human rights leader, whose moral authority, I think, is kind of important in the debates about what human rights ought to be respected and what governments should be required to do, doesn’t want to take part in the discussion,” Cingranelli said. Throughout the discussion, Cingranelli encouraged attendees to ask questions and enter civil discussions about their personal politics and relationships to human rights issues. Lizzie Nutig, a sophomore majoring in philosophy, politics and law, said she decided to attend the discussion because she found the intersection of human rights with the midterm elections to be interesting.